Just a quickie before I head off to the hospital as I really wanted to put this out there first. This will be part of my showreel at Men At Work Pictures after I get that website up and running. The result of 6 months of rendering time alone, here is a short "showreel" type movie I put together. It has a few shots of Battlezone cabinet 3D model, and then switches to the glorious Tron cabinet 3D model. All set to music. Just saw the doctor and they are going to admit me to the hospital. Just off the top of his head, the doctor estimated I'd be out maybe Monday or Tuesday, but that's just a guess of course. It all depends on how things respond. Treating a Crohn's flair-up and an internal infection at the same time is particularly tricky, as the treatments for Crohn's are almost universally some form of immune-suppression. Not what you want to do when you've got an infection raging already. So the course of action will be attack the infection first with IV antibiotics for a few days, get another CT scan to see how things are doing, and then begin treating the Crohn's to try and get it back under control. Anyway, if I'm able to post from the hospital, I'll post. Otherwise, I'll have all my stories from my trip to LA all ready to go when I get out next week sometime. I really can't wait to tell all about it! Just spoke with my doctor over the phone and he says it sounds like I'm doing better. Instead of admitting me immediately to the hospital they're just going to see me in the office tomorrow. Short of being admitted, I'm sure I'm still in for some hurtin' tests. And of course, I may still be admitted after they see me tomorrow. Hey all. Things have been happening with the garage, and I've got lots of cool stories to tell from my trip to LA for the LA Film Festival and a special screening of Chasing Ghosts at Pixar(!). In the meantime, my Crohn's Disease has blown up an I'm going to be admitted to the hospital for a few days. They tell me a few days anyway. The tests I had done show significant Crohn's activity and an internal infection. Very not good. I promise I'll update the blog when I return home. The electricians were out today and pulled the wires through for where the outdoor fixtures will go. This big load of lumber also showed up - I'm pretty sure this is for the stairs going from the house to the upstairs of the gameroom, and from the house down to the yard (the existing stairs were removed to make room for the gameroom). I also noticed today that the shingles that were damaged a month or so ago are now fixed. I'm not sure when that happened, but I was happy to see it. 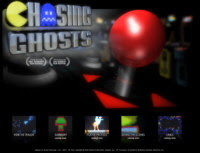 All planets finally came into alignment, and we now have a website for "Chasing Ghosts", including a trailer for the movie. I did all the website work. Lincoln, the director, cut the trailer. I'll be leaving town this coming Thursday to head out to the LA Film Festival where Chasing Ghosts has a screening on Saturday. Should be lots of fun! Tada! 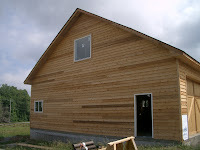 The siding is done all the way around! They also replaced the curved wood trim pieces at the top of the bay doors with straight pieces at my request. 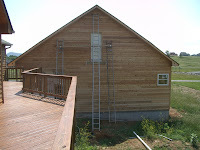 They did finish up the siding today. With the exception of a triangle at the peak of the roof on the other side of the building that is still undone. Still no sign of the stone mason. He was supposed to be here Monday to do the stonework. The worked a bit on the siding today. They also finished up the bay doors, including the curved trim pieces at the top. But now that I see them, I actually don't like it. I'm going to ask them to replace the curved pieces with a straight board like there is across the bottom. 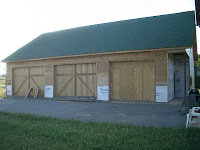 So yesterday they did a little bit of the siding and work on the bay doors. Today nobody even showed up. Siding is almost done on the front of the building. They just need to do that last door and the curved wood pieces that go across the tops of the doors. The blank areas at the bottoms are where the stonework goes. *Yawn* Oh, hey look! 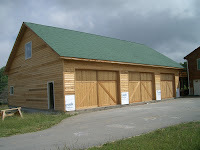 They worked on our garage! Basically all they did was another one of the bay doors and the last remaining window (this was keeping them from being able to finish up the siding on one side of the building).